If you’ve been using SearchTempest for a while, you’re probably familiar with its My Searches feature. It automatically saves your recent searches so you can access them later without having to fill out the entire search form again. It also lets you tag your searches as favorites, so those searches will be saved forever (or at least until you don’t want them anymore). It’s handy if you run the same search pretty frequently, or if you are jumping back and forth between searches. If this is the first you’re hearing about this feature, then you should totally try it out. You can access it by clicking that little yellow star just above the search button on the SearchTempest home page. Why am I bringing this up? Because we just brought that same feature over to AutoTempest, that’s why. You can find it in the navigation bar at the far right. So now your favorite used car search just got that much more awesome. Eventually, we’d like to add to both SearchTempest and AutoTempest the ability to login to those sites and save your searches so you can access them from a different computer too. Keep an eye out for that in the not so distant future! If you’re new to AutoTempest and would like to know about it, keep reading after the jump. As you know, we’re on a mission to make used car buying the easiest, fastest most efficient process possible with our used car search engine AutoTempest. With that said, constant improvements are the name of the game! As someone who lives in Canada, ever feel like our friends south of the border have it WAY easier when it comes to finding a used car? We certainly thought so, and we’re pleased to say, no more! AutoTempest already searched Craigslist and eBay north of the 49th, but we’ve now added the #1 used car classifieds site in Canada, AutoTrader.ca to the AutoTempest car search platform as well. 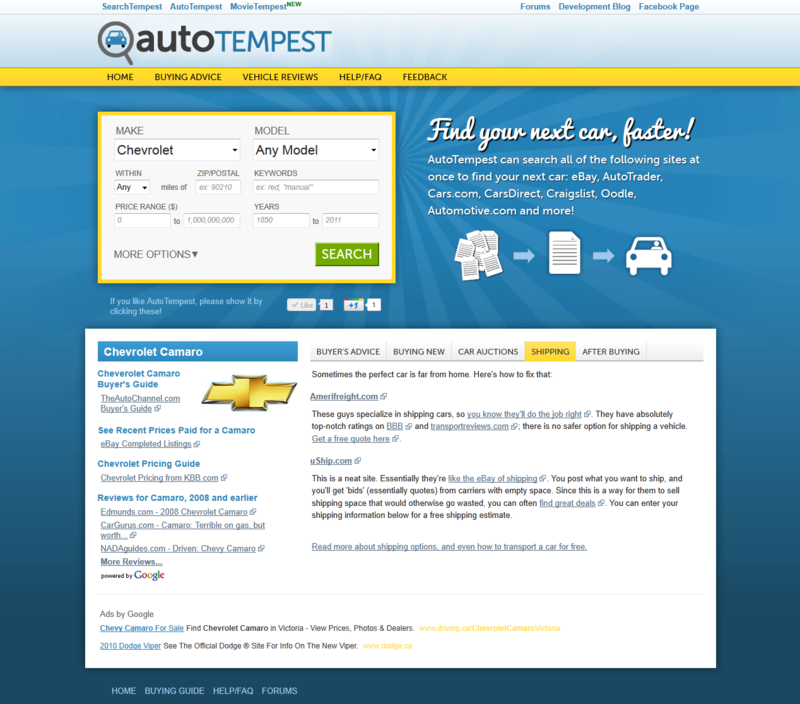 When you search used cars online with AutoTempest, you’ll now get an even greater volume of listings in Canada. But what if you’re planning to look across the border too? As we all know, there are some great deals to be had by buying a used car in the States. Well, AutoTempest now supports Canadian postal codes, even for sites like Cars.com and CarsDirect that only operate on the US side of the border. No more wasting time figuring out and looking up nearby zip codes in the US… perhaps while cursing the fact that the only ZIP code you can seem to remember is 90210! AutoTempest will now automatically find the zip code of the border crossing nearest to you and use that for any sites that require a zip. So if you’re like many, curious about the incredible car deals you hear about down in the States, AutoTempest will give you the straight goods, as always, all in one place. We’d love to hear your thoughts on the Canadian improvements… let us know in the comments. Thanks everyone for the feedback on the new AutoTempest design! You have no idea how helpful it’s been for us. Seriously, you guys rock. From listening to what you guys have been saying, we’ve garnered that you don’t much care for being sent to the landing tab after you make a search. So we’re getting rid of it, easy as that. Now when you make a search, you’ll be given listings instantly, not having to worry about clicking through to another tab to get what you came for. To make up for some of the functionality lost with the landing tab, we’ll be adding a toolbar to the bottom of the page that will allow you flip through the tabs, adjust your search settings, and access a tips page that will give you pointers for using AutoTempest more efficiently. Lastly, we’ll be adding a Getting Started guide to assist those who need a bit of a helping hand using our application. So, thanks again for your feedback, and keep it coming!